Parents, mayors, governors, and President Obama are all talking about the importance of high-quality preschool programs and about how they can help children become proficient third grade readers. But with all this energy and action, it can be easy to lose sight of how, specifically, policymakers can have a positive impact in these areas. It’s a “reference guide for policymakers and their staffs on the most commonly requested topics from preschool to third grade,” according to the guide’s executive summary. Preschool. 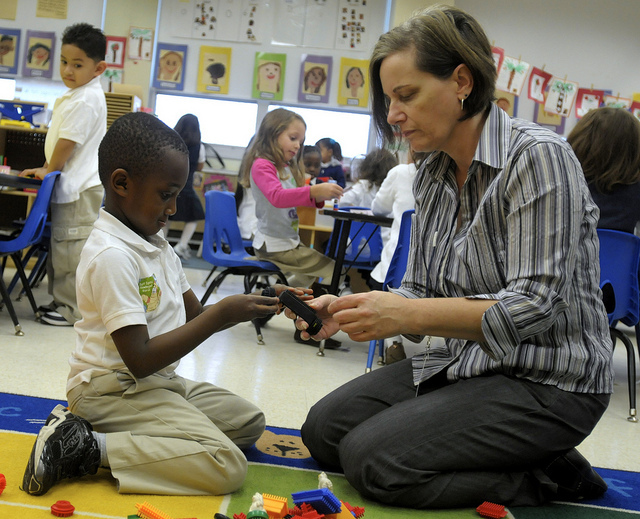 Access to high-quality preschool programs for 3- and 4-year-olds. Transitions. Strategies to support children in their transition to kindergarten. Full-day kindergarten. Full-day kindergarten programs for 5-year-olds. Kindergarten entrance assessments. Using kindergarten entrance assessments to identify school readiness gaps. “What are the foundations of any effective P-3 approach?” the guide asks. High-quality P-3 programs. Characterized by exceptional educators and leaders who use ongoing data collection to inform instruction and practice. Aligned standards, curricula, and assessments. Ensuring state’s learning standards, curricula, and assessments are aligned to support children from preschool to third grade. Efficient P-3 finance. Coordinating funding streams that support P-3 programs to maximize dollars and reduce inefficiencies. The section “Policies to Promote Third Grade Reading Proficiency,” lists as a resource “Turning the Page: Refocusing Massachusetts for Reading Success,” a report commissioned by Strategies for Children. What’s the status of P-3 governance? “…Arizona, Colorado, Georgia, Maryland, Massachusetts, Oregon, Pennsylvania, and Washington have established state- or department-level structures to coordinate early childhood programs and services.” Here in the commonwealth, that structure is the Department of Early Education and Care. “Setting children on a path to academic success early in life is the most effective and cost-efficient way to prevent high school dropouts and secure the economic stability of our country and future workforce,” the guide says.